Kamala in the Cloud is a platform developed by Morpheus to effectively model domain knowledge in the cloud. 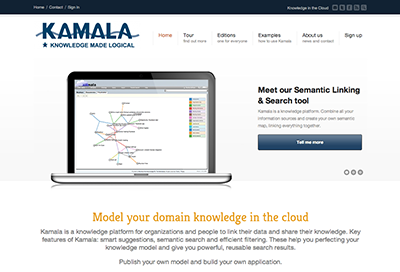 The Kamala application is driven by a single knowledge model. The advantages are that you can easily enter, change and publish data, the application is very structured and you are supported in your process by the application. Knowledge driven applications are becoming more popular, an example is the Google autocomplete algorithm that offers words and phrases similar to the one you are typing. In Kamala, you can make every concept interactive. For instance, when you connect an employee to an organization, just start typing and Kamala will provide suggestions based on existing persons in your knowledge model. This allows you to enter information much faster and reduces the chance for mistakes and double entries. In addition, Kamala offers a powerful and efficient search and filter method (using SOLR). Knowledge bases, taxonomies and thesauri can easily be integrated and maintained from one model. Relevant, related subjects are shown in the correct context and can be used as search and selection filters. Add metadata to your documents using keywords and terms from the ontology, taxonomies or thesauri. Link them to other information to make them more accessible in your web application. Visit the Kamala website for more information!